B&W announces 800 Series Diamond Prestige Edition speakers | What Hi-Fi? 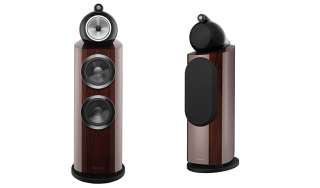 The premium versions of the 805 D3 standmounter and 802 D3 floorstander are finished in ‘santos rosewood'. While ultimately it was class-leading resolution and clarity that led to the B&W 805 D3s five-star What Hi-Fi? review, the fact they uphold B&W’s reputation for making fine cabinets certainly contributed. Well, as fine as they may be, B&W has decided to create Prestige editions of the 805 D3 standmount (as well as the 802 floorstanders in the same 800 Series Diamond speaker range) with high-gloss ‘santos rosewood’ finishes instead of the range’s regular black, satin white or rosenut options. And we have to say: they do look rather swanky. B&W claims the speakers are acoustically unchanged from standard 800 Series Diamond guise - they feature every technological aspect, from the ‘matrix’ (B&W’s new internal bracing) cabinet construction and distinct ‘turbine head’ to the Diamond dome tweeter, as well as Continuum and Aerofoil drive units. It apparently takes around four weeks for B&W’s craftsmen to apply the finish in the company’s UK factory, with the process (which involves 13 coats of lacquer) requiring 40 per cent more manufacturing time than a standard 800 Series Diamond model. And yes, you’ve guessed it: it’s going to cost you. The 805 Prestige Edition costs £5500 per pair (£1000 more than the standard variant), while the 802 Prestige Edition (£19,500 per pair) commands a £3000 premium over the 802s.